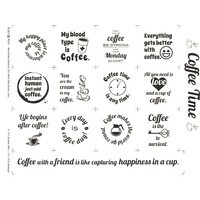 This Coffee Time Fabric Panel is covered in small blocks that are intended to be cut out and appliqued onto quilt tops, wall hangings, bags, and other homemade items. 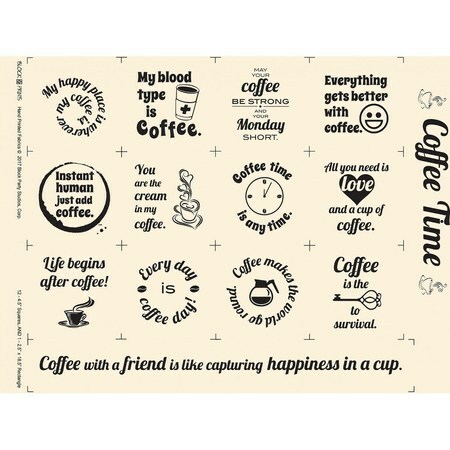 Perfect for coffee lovers each Coffee Time Fabric Panel contains 12 small blocks measuring 4-1/2in square and one large block measuring 2-1/2in by 18-1/2in. The overall panel measures 18 inches by 22 inches. Printed in black ink on an ivory background made of 100% Kona cotton, this panel is perfect for quilting. 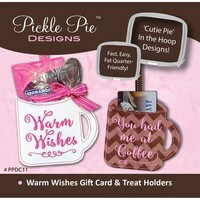 My happy place is wherever my coffee is. Instant human, just add coffee. You are the cream in my coffee. Coffee makes the world go round. Coffee is the key to survival.